Inbound marketing basically means helping your customers through their buying process – from being aware that they have a need, to their final decision on a purchase. In that process, you use a marketing automation system as the engine and a lot of valuable content as the fuel. Broadly speaking, inbound marketing works by attracting visitors to your website by publishing content that people find in their online research process – for example, through Google or on social media. On the website, you convert the visitor to a lead by offering a piece of content that is so valuable that the visitor would like to give his email address in exchange. Now you have a lead that you can send further targeted content through automated email sequences until the lead is “warm” enough for the sales department to take over the sales dialogue. Here we will give you a bird’s eye overview of what inbound marketing is for size. Tip: You can select the chapter or section that seems most appealing to you by clicking on the list below. Below each section, there is also a link that sends you back to the overview. Chapter 2: Why should I work with inbound marketing? Who is inbound marketing best for? What can inbound marketing help me with? What is the alternative to inbound marketing? Chapter 3: How do I get started with inbound marketing? See the video below for a quick insight into inbound marketing as a method, and then do a deep dive into the different parts that inbound marketing consists of in the sections below the video. We can roughly divide marketing approaches in outbound marketing and inbound marketing. Outbound marketing is the most intrusive approach to marketing or advertising. It has traditionally been used in media such as newspapers, outdoors in, for example, bus shelters, building facades, radio and television, but it is also used online in the form of banner ads. Here it is about use the shortest time or least amount of space to display their message, because the advertising space is usually very expensive or limited. Outbound marketing, however, loses ground in a market that is increasingly online and feels saturated with advertising. Spam filters become more and more effective, people sign up for the Robinson list, and many people use Ad Block in their browser so they can avoid being disturbed by the ads. Traditional advertising is no longer welcome by many people. People want the feeling of having control over their own decisions, and most customers are already past the half-way mark in their buying process when they contact a new supplier. Welcome to the customer’s age. As a response to the lack of effect of outbound marketing, inbound marketing has begun to gain entry into the marketing arena. Inbound marketing is about being there for customers when they need you. You do this, for example, by creating content that is helpful and that does not focus on fast sales, but on helping the customer make the right decision. This is usually done using blog posts, videos, podcasts, webinars, e-books and similar content, which basically has a somewhat longer format then is used in outbound marketing. As mentioned above, it is nothing new that companies that are known to be helpful and provide good service get more customers. That approach have traders used as long as trade has existed. The new thing about inbound marketing is that you use digital technologies to provide this service. Among other things, the technology means that you can reach much further geographically than you could in the past, and tools like marketing automation can help provide a good service to many more. Inbound marketing is roughly speaking about attracting its potential customers, obtaining permission to contact them, educating them through their purchase journey to eventually sell to those who are buying savings. To do that, we use an easier advanced form of lead generation, consisting of several phases, because we distinguish how hot our leads are and thus how we should treat them. In inbound marketing, we have a sales funnel that goes through four phases: Attract, Convert, Sell and Excite. In HubSpot terms, the phases are called attract, convert, close and delight. 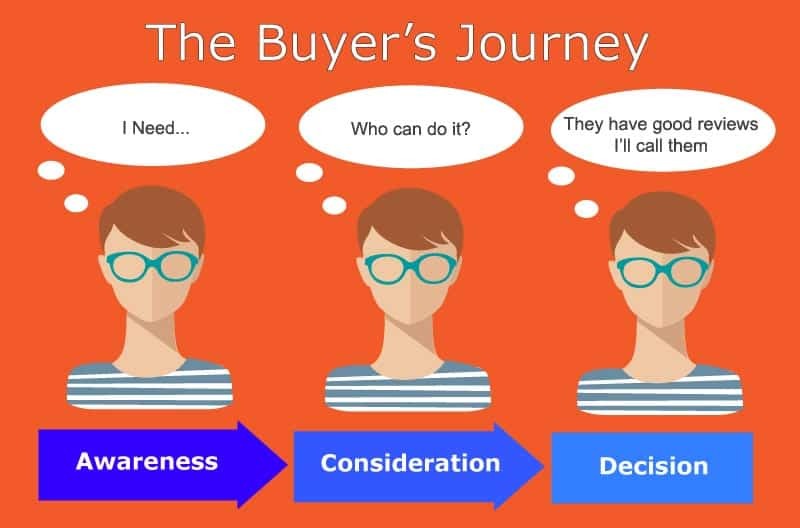 We have a similar purchase journey consisting of three phases: Awareness, Consideration, Decision. At the start of your purchase journey, your lead is in the Awareness phase – in fact, they have not become a lead yet. Here he has a latent need; He knows there is a problem, but not yet how to solve that problem. Here we use inbound marketing content to address his possible needs. In the Awareness phase, we think about what our lead in this phase is looking for, as well as how we can help, and then we make content that addresses it. Note that we are not trying to sell anything here – we just make sure that we know and understand their problems. Then we get to the Consideration phase of our sales campaign, where the goal is to attract their attention to us. Our goal in this phase is to attract new visitors and make them move into the conversion phase, where they give us their contact information and thus become a lead. When your lead has come closer to its problem, the person is in the Decision phase. Here, they will look for concrete options that can solve the problem. In this phase, we use inbound marketing to create content that helps the lead to find the right solution. Our solution may not be right one, and the content would reflect that. We can solve some challenges, but not all. Here, we need to relate to our own services or products in order not to lose the leads confidence. Remember, we are there to help. At the sales stage we are now in the Conversion phase, where it is easy for our leads to decide whether they want to enter into a dialogue with us. When your lead has figured out what needs to be addressed, he or she is in the decision-making phase. Here you have to up the appeal and let loose, because now it’s no longer a choice between your solution and a completely different solution. Now it is the case whether the supplier will be you or your competitor. It is only in the purchase journey’s closing phase that you can speak with a sales pitch so it is important that you do that now. This is it! But… One thing that many forget is that the customer’s trust in you as a supplier is still developing, even after the customer has become a customer. Therefore you have to continue to treat them well because you want to keep them as a customer, and you especially want them to go out and say to their network that they got a great deal with you. The Delight phase of the sales funnel is therefore about protecting your customers on a continuous basis by giving them extra value in the form of new knowledge, extra services or the like. Most people have heard about content marketing and after reading the above, you may want to think that inbound marketing sounds much like content marketing. And that’s not entirely wrong. However, that is not true either – because there is little need for us to go from calling content marketing to inbound marketing. Both disciplines are about educating their audience with relevant and relevant content and helping the customer to make the right (purchase) decision – i.e. being an expert in the field. The difference between content marketing and inbound marketing is that inbound is focused on lead generation – so we use a number of tools to convert our visitors to leads and to push our leads forward on the purchase. We do not do that with content marketing as independent discipline. Basically, inbound marketing is content marketing with lead generation, marketing automation and a comprehensive analytics tool set. With inbound marketing, you use content marketing to generate leads as you deal with marketing automation. And then it’s measurable so you can constantly keep an eye on what works and where you should optimise. Search engine optimisation is about optimising its website to be found in search engines, and therefore it makes it a very essential part of inbound marketing. If inbound is about to be there when people are looking for help, it is of course a prerequisite that you will also be found in search results. Google is the most dominant search engine, which accounts for approx. 92% of market share for search engines . Google has increasingly started prioritizing topics over some keywords, and the better a topic is covered, the better website authority at Google, and thus a better ranking in search results. We therefore also see that more and more people have begun working with what we call Topic Clusters. A Topic Cluster is an overall subject that consists of several subtopics. 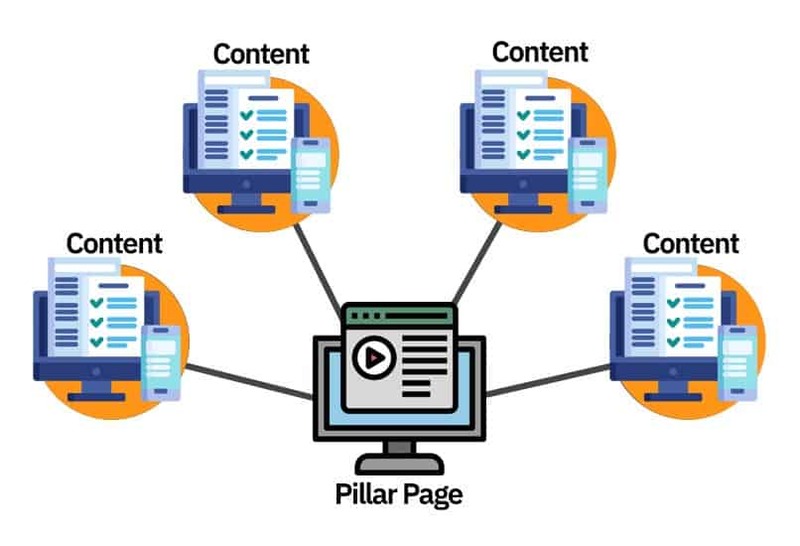 Typically, you will have a Pillar Page that covers the broader subject and you will then link to content that covers the subtopics. This strategy is particularly suitable for inbound marketing because many of your blog posts will cover the sub-topics of a larger topic. This means that you can achieve a high website authority by systematically linking your Pillar Page and your blog posts. It’s not enough just to make good and helpful content and optimise your website for search engines. You also need to draw attention to yourself and your content on social media. There are two reasons for this. Firstly, when promoting your content on social media, if you are doing well, you will quickly get a lot of traffic to your content. This traffic boosts your content in Google, because Google measures, among other things, your website on how many people visit it. Secondly, social media are gradually woven into our everyday lives that you cannot go without using your network here – just as you use your physical network. As mentioned above, inbound marketing is largely about positioning itself as a thought leader, and you should do it everywhere – also on social media. Email marketing is basically used in two ways in inbound marketing: First and foremost for lead nurturing and then for newsletters. In lead nurturing we protect our leads and give them a helpful push in their purchase journey . 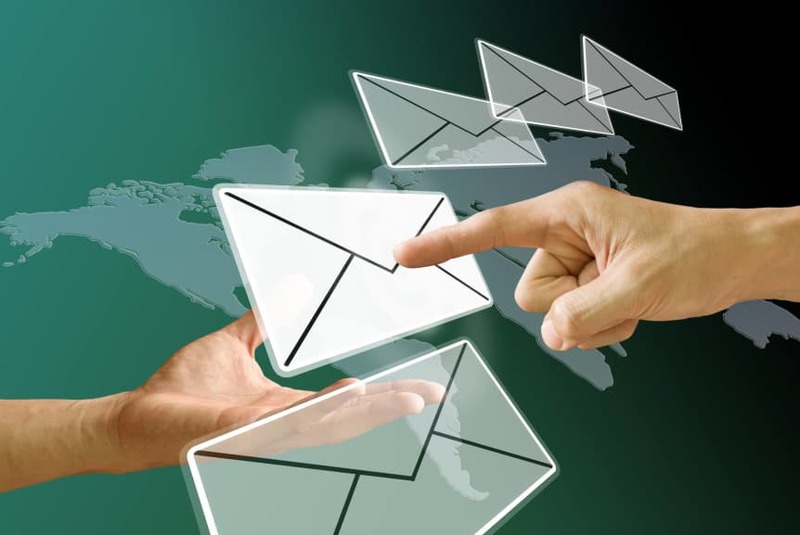 Here we will design an email flow that will take effect once a lead has performed a specific action on the site. Here, our leads will receive emails that promote content that fits their stage in the purchase journey so that we convince them to make a purchase. Your newsletter, on the other hand, can serve many purposes and you can have different newsletters for different target groups. Most importantly, however, it is something your audience has signed up because they are interested in keeping up to date on the latest news from your company. You can use the newsletter to promote your content, just as you do with lead nurturing, but the primary purpose will typically not be pushing leads further in their purchase journey. It may be that you have an internal newsletter in your organization, one to existing customers, one for investors or for potential candidates for a job in your company. It is up to you and the purpose of the newsletter will be different depending on who it is addressed to. Contextual marketing may not be a discipline as it is an upgrade of other disciplines. It’s about taking into account the context in which a given piece of content is consumed and thus achieving a good user experience. Many will obviously call the discipline of personalisation, but there is a bit more in contextual marketing than just personalisation. 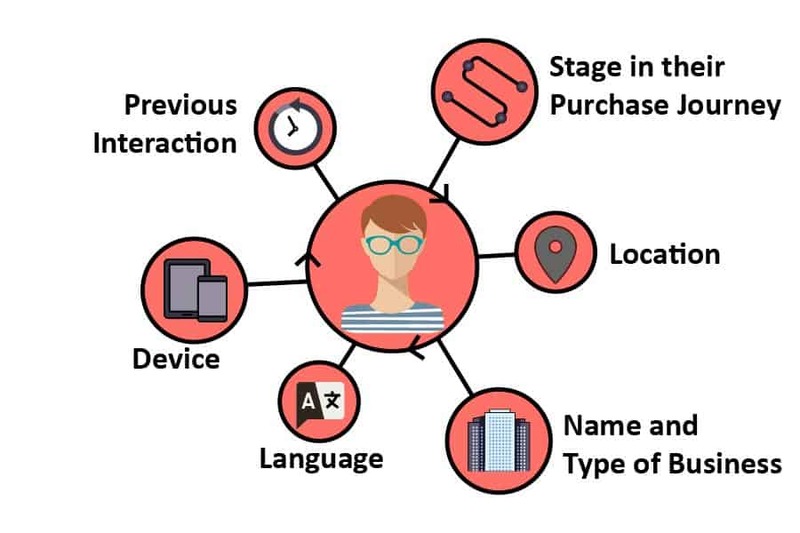 Contextual marketing can be set up to take into account where a visitor to your site is in the purchase journey, which website pages he or she has visited before, where in the world the visitor is, what type of device the user uses and more. Contextual marketing means that you create a website that is tailored to specific segments and the context they are part of and then to make it more relevant to the individual user. The custom content in contextual marketing is called smart content. In principle, you can make inbound marketing without making contextual marketing, but if your software allows, then it will be our clear recommendation to do that. Inbound marketing usually generates and retrieves typical data enough to make some quite interesting segmentation that can add value to your visitors, and that is what inbound marketing is all about. Your ability to work with contextual marketing is solely dependent on which system you use for inbound marketing. Inbound marketing consists of a variety of tools that you can connect together which you can measure your overall effort on. Common tools in the work with inbound marketing include blog, landing pages, call to actions, forms, marketing automation, CRM and reporting. The most common way to work with content marketing is using a blog. Here you will establish yourself as a thought leader by sharing your knowledge. Thus the blog aims at attracting visitors to your website who are interested in getting the knowledge you offer. At the same time, the blog aims to promote your premium content and thus be part of your lead generation engine. Landing pages are the pages that you use to present a piece of premium content, and it is also here that your visitors convert to leads through a form that you have implemented on the page. The Landing Page’s sole purpose is that your potential leads end up converting, so it’s absolutely essential that it’s optimised for that purpose alone. When you have visitors to your site that finds something valuable, it’s your job to help them find even more value. One of the most important elements for achieving it is your Call To Actions (CTAs). They can be designed as pictures, or there may be buttons with some text – Common to CTAs is that they draw attention to what you want the user to do. As described above, forms are often located on landing pages. However, forms can be implemented anywhere on your website. They aim to retrieve information about your visitors, and in inbound marketing we will most often say that a person who has filled out a form on your website is a lead. Marketing automation is part of several disciplines in inbound marketing, and the more processes your software can handle, the better and more efficient inbound machine you can build. Marketing automation simply means that we automate some processes in marketing activities, which should otherwise be handled manually. It may be sending emails, social media postings, segmentation, leads selection/scoring, creation of sales topics in the CRM system, etc. And there is more and more being added to this. In order to take advantage of the marketing automation machine behind inbound marketing, it’s an advantage that you have a CRM system that can work with it. The full enjoyment of inbound marketing comes when the leads generated by marketing flow directly into the sales department’s CRM system in order of priority and with a clear insight into what the same leads have done on their journey. Inbound marketing is highly data driven, so you should have a good reporting tool that you can learn so you know what to optimize to improve your activities . You should be able to follow all your leads through their purchase journey from the first conversion until they become customers and you should also be able to see which sub-elements of your marketing activities are doing well or less well. Are you curious whether inbound marketing is something for your business? Then proceed to Chapter 2: “Why should I work with inbound marketing”. Here we come across who inbound marketing is for and what the method can help with. CHAPTER 2 – Why should I work with inbound marketing? Let’s just get this nailed: You may not need to work with inbound marketing. There are some clear assumptions that must be right before you throw yourself into it. Inbound is particularly suitable for B2B and is particularly suitable for companies that have a long and complex sales process where customers need a high level of knowledge in order to make a purchase decision. The advantage of working with inbound marketing is that you can customise your communication to your potential customers’ purchase. A person who has not yet been clarified in relation to his actual needs or problems will be more likely to run away if you communicate sales, whereas it will be quite appropriate to communicate sales messages to a person who is ready to buy. With inbound marketing, you can nurture those leads that are not yet ready to buy, thus giving them the knowledge they need when making the final decision. Companies that have a high lifetime value per customer, while at the same time experiencing that the customers take a long time to make a decision to buy or not to buy, will most likely benefit from inbound marketing. If a customer finds it difficult to decide, it may mean that they have not yet understood their needs or that they have difficulty in understanding how your company can help solve the problem that they are faced with. With the help of thought leadership and lead nurturing, your company can get ahead of the queue for the customer’s attention as you educate the customer to make the right decision. The extensive data collection in your marketing automation system also ensures that you have a good overview of which marketing activities are working and which are not. Inbound marketing is a growth machine, and most companies find that they save a lot of resources and frustrations in the sales department once the machine is in daily operation. Inbound marketing aims to nurture your leads so the sales department gets the opportunity to get to the hottest leads first – while they’re still steaming. It saves you a lot of resources compared to using the traditional cold canvas method. And what are the elements of inbound marketing, that is so different from the way many businesses traditionally conduct business? You’ll get a review below. Ok, you’re well placed to position yourself as an expert, even if you’re not working with inbound marketing. To name a few examples, you can hold lectures, participate in podcasts and radio shows, and you can blog, both on your own blog and as guest blogs on other people’s blogs. All of that can easily be part of your inbound strategy, but it is not in itself inbound marketing. Having your own blog is, however, an important component of inbound marketing. Your blog works as a part of your conversion device, where you convert visitors to leads and leads to purchase ready leads. We will get more into it later. To blogging on your own blog is also the way to practice thought leadership on that are most profitable and where you have the most control over what is being published and when. 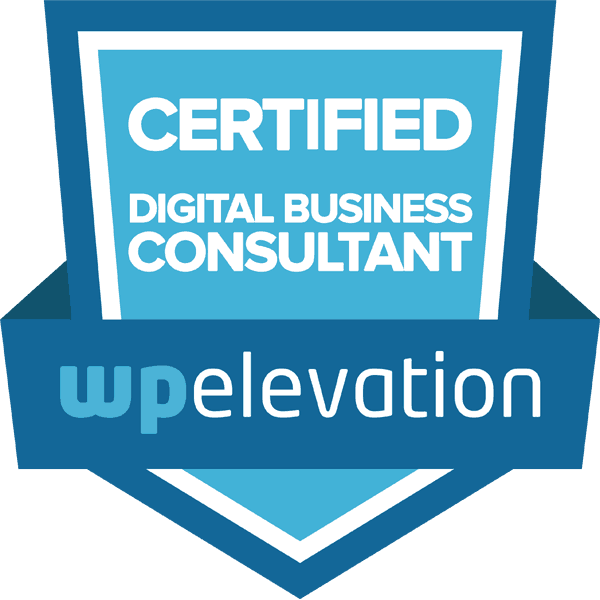 You are about to add an extra layer to your brand by positioning yourself as an expert. That way, you separate yourself by not appearing as one of many that sell a product or service. You will appear more helpful and generous when you do not demand money for every little bit of your knowledge. And people like to buy from other people who don’t just do anything to get money for it. Passion and helpfulness sell because it is sympathetic. In general, inbound marketing is strongly associated with business development. You can take a vision, break it down to the goals and then really measure whether the goals are achieved or not. You can see which segments you reach and with what resources and how many of them become customers. That way you will also be able to prioritize your efforts in relation to what works and what does not and you can customise your strategy as you learn more about your customers. Traditionally, the marketing department has created awareness about your business and sales typically have done the cold calls in the hope that they reached someone who had seen one or more of the marketing campaigns so they knew a little about the company in advance. However, there is no doubt that the knowledge they have of the company through advertising or other traditional marketing has not always been perceived equally positively by the potential customers. So there is nothing to say that the sales department has often felt that they pulled the whole load and that marketing just made some colourings and sat in the circle without contributing anything valuable. On the whole, it means that it has been the sales department’s task of obtaining leads at the same time as implementing sales. This also means that sales have in all probability spent a lot of time – through countless conversations – nurturing and warming the leads they have acquired before the sale has taken place. However, in inbound marketing, the roles are divided differently. Here, marketing takes over lead generation. They collect demographic data about your leads through forms, and they build lead flows to nurture these leads through your marketing automation system. In order for us to call a visitor for a lead in inbound marketing, he or she must convert. This happens by filling in a form on your website where he gives a little information about himself. Initially, it will typically be name and email, but it may also be questions about company size, revenue, business challenges etc. Lead flows help keep your leads as you want to send them content on a regular basis related to what they initially converted on. You can see lead flows as a mini-course consisting of small lessons that you link to via e-mail. It can be blog posts, videos, tests, games, calculators, etc. Each time a lead visits your website; they will automatically provide data about their traffic. Sales can thus get an overview of who knows your business and they will also have information about how well those leads know you and whether they fit your ideal customer profile. And all the information they have even available before they call a lead for the first time. Sales thus avoid spending a lot of time calling each lead and qualifying this, and marketing makes themselves useful in a completely different way than it has been before. When marketing has already done much of the work to nurture your leads, sales won’t have to start from scratch when they call a lead. The conversation simply starts somewhere else because the lead is already ready to talk to your salesperson. The time in the sales department is thus used to speak with qualified leads, and the cold canvas methods can be allowed to let go. When your visitors return to your website, you can enrich your data with information about their behaviour through your marketing automation system. This means that marketing automatically accesses real-time statistics on the user behaviour of your website. For your marketing staff, this data is relevant because it enables them to assess which topics that are relevant to your target audience that they should be informed about. The more marketing about your leads, the better they will be able to help them in the right direction by creating e-mail sequences that serve content that suits what your leads need for their purchase journey. They also have the ability to improve content that works less well and do more of what works well. Your data also contains relevant knowledge for your salespeople, as data can give them insight into interests and how much your leads know about your business already down to a personal level. It can ask the seller how to start the conversation and when the lead has read enough to receive a call. Sellers can also see demographic data about their leads, as those leads have filled out forms on your website. This enables the sales department to assess whether the lead is a good prospect for you. All of the above information is available to sellers on the individual leads contact profile. It will therefore be possible for the individual seller to decide on a well-informed basis who is worth contacting based on the type of business they are from and when they are ready to have a conversation with your company. For inbound marketing to work properly, it is absolutely essential that your sales and marketing department can work closely together. When marketing takes over lead generation, it is of course important that they are completely aware of what the sales department needs to know when calling a lead. It demands marketing to produce content that helps your leads throughout the journey rather than push sales messages out in ‘colourful shock campaigns’. It is also important that the sales department correctly uses your inbound machine and not just continuing to do what they usually do. One of the major strengths of inbound marketing is the lead nurturing part. Your leads are educated through their buying process, and sales should be able to assess which leads are the warmest so they only call those who are most likely to buy. One of the big challenges in marketing has been that there is a broad consensus that there is a need for marketing, but rarely is anyone knowing the real ROI of the marketing activities put in the works. Inbound marketing, of course, does not change the fact that it is still difficult to calculate the real ROI of a full-page advertisement in a magazine, but the activities associated with inbound machinery can be measured and this is a clear strength. With inbound marketing, you can easily see how many of your customers have enjoyed Frankie’s colourful advertising, thus giving you an overview of what to do more and where there is room for improvement. Remember, however, there must be room for experiments. The strong thing about inbound marketing is that you can do just that and you can measure it, make changes and measure it again. It makes inbound marketing an amazing method to learn from. This transparency allows you to see what changes are giving fruit and you have the opportunity to do more of what works. As mentioned above, inbound marketing is not for everyone. In general, we do not recommend purchasing expensive software if you do not really have the need. For example, you can make good lead generation without having an extensive inbound marketing machine. You can also play with some of the aspects of inbound marketing – such as email flows/sequence – without working with all of the inbound marketing aspects. And it may be a sensible choice to try some of the things before choosing to invest in a marketing automation system that can give you the whole package. For example, we have experienced that many of our customers have experimented with a mini set-up containing an email system, a CRM system, and a website that is built with WordPress CMS system before they choose to go all in with inbound marketing. Here are the steps to follow to get a good start. CHAPTER 3 – How do I get started with inbound marketing? As we mentioned above, inbound marketing is a growth machine – especially for B2B companies that sell services with high complexity or have customers with a long decision-making process. But the method is also at a high strategic level and incorporates many different marketing disciplines. Therefore, it does matter how you’re planning the strategy when you want to start with inbound marketing. But don’t worry – the help is on its way. We will give you a review of what to do in order to get started. Inbound marketing is not a marketing project, but it is not an IT project or a sales project either. It is a business development project. So it then also includes many of the key people who are dealing with your business. It is important that marketing helps to work differently than they are used to. They must be prepared to take over lead generation and they want to produce content for all parts of the purchase journey and undertake a bit more technical and heavy strategic tasks than they may be used to. Sales need to be more advised to act as advisors, and that the chase of quick sales should be in the background. In addition, they must be prepared to spend time sharing their knowledge about the customers so that their knowledge can be translated into content that marketing can use in the “inbound machinery”. It is absolutely essential that management focuses on thinking new initiatives into the inbound strategy so that they do not oppose it. The contact that the consultants have with your customers should be considered in the inbound strategy, and consultants should use your marketing automation system to log important customer relationship information. Just as it is important that sales share their knowledge about the customers, it’s also important that consultants make it a habit to share their knowledge about the customers. If you have customer service in the house, it is also important that they agree on how information about customers must be logged and shared in your system. In addition, customer service has a unique insight into customers’ challenges, and they must be prepared to spend time sharing. Your experts in the company must be available (it may be all of the above but also other experts who do not have customer contact) so you can produce quality content that have roots in your company’s professional expertise. Experts must interview themselves or produce content about their professional area. We often see that it can be a big challenge to get the employees to prioritize this part if they do not understand the value that their input creates. Inbound marketing is a long-term strategy, and it must never stand for itself. Your inbound strategy must be based on your overall strategy, understood to support your value propositions and aspirations of growth. Positioning – Who do you help with what? Therefore, before you start with inbound marketing, you must have a written statement of your positioning, which makes it clear who you want to service with inbound marketing. Here you should decide what kind of business you would like to work with and what persons in the business you are going to communicate with in order to make it happen. You must also be aware of the challenge or desire you want to help your persona solve or achieve. The latter is the basic idea behind the “Jobs to be Done” theory, that is, what job your solution performs for that persona. You should be able to answer the question: “Who do we help and what task do they try to solve with our solution?” If you know the answer, it’s easy for you to assess which customers you would have and why they must choose you rather than others. But it will also be clear where you should consider adjusting your services. Once you’ve mastered the basics, you’ll also set goals. It must be SMART goals – that is, they must be specific, measurable, attainable, realistic and timed. An example of a SMART goal is: “We will have managed to generate 200 sales leads (SQL) in 2018 and thus increase our number of leads by 20% compared to 2017”. A basic part of inbound marketing is lead nurturing so it’s important for your content strategy that you speak to your personas in all phases of the purchase journey and that there is a connection between the topics you address in the different phases of the purchase journey. For example, if your business is a recruitment agency, one of your persona’s ‘Jobs To Be Done’ may be to hire good employees because it makes them successful in their HR department. A good content strategy focuses on making content on the topic that helps them – both when she is unaware of what to look for (awareness phase) when she is in doubt about which option she should choose among several (consideration phase) , and when she’s almost ready to make a decision and only the last push is missing in the right direction (decision phase). You must plan a campaign for each of the three phases of the purchase journey, so each phase consists of several pieces of content and a piece of premium content. Good content is not enough. If no one sees your quality content then your powers is wasted. Your strategy must therefore also focus on promotion. Here you should consider whether you want to use social media, whether you want to focus on being found through Google, something third or a mixture of multiple tactics. You also need to make a clear strategy for the effect you want from your promotional efforts and how you want to carry on. Here too you should make SMART goals. Last but not least, you need to make a collaboration agreement – a so-called service level agreement (SLA) between marketing and sales. No one in the two departments must be in doubt about the role they play in your strategy. Everyone must be completely clear who is responsible for what. You must write it down and make sure that everyone has signed the agreement and has access to the document. Inbound marketing must never ever become a marketing project alone. The entire organization must work together, and in particular, marketing and sales that are responsible for day-to-day operations will function as a team. To get started with inbound marketing, you need to choose a marketing automation system that you will handle your inbound activities through. We recommend that you choose a system that does not require too much basic integrations. There is the fundamental challenge with integrations that the more you have of them, the greater the risk that your data becomes misleading or parts of your functionality will be lost. A marketing automation system should at least contain features for email marketing, social media marketing, lead generation and analytics. In addition, it should be possible to segment their contacts through the system and to automate targeted campaigns against these segments. Some automation systems also include features such as SMS marketing, lead scoring, and advertising, as well as some systems, have an integrated CRM system. So, there are many things to consider when choosing the marketing automation system that suits you and your business. In 2017, G2 Crowd conducted a survey that maps customer satisfaction and market share among many of the major marketing automation software players in the market. Among the players in the survey you will find Marketo, Pardot, Adobe Campaign, Mailchimp, and at the top with the biggest market share and best customer satisfaction you will find HubSpot. In addition, HubSpot offers a wide range of standard integrations to third party software such as WordPress, Lucky Orange, TwentyThree, Zapier, Survey Monkey and Eventbrite. See the full list here. All in all, with HubSpot, you can build a solid inbound marketing machine that has wide capacity to be tailored to your and your company’s individual needs. Inbound marketing is a strategic heavy discipline to get started and to make it work, it is important that you and your team have a good understanding of how the various marketing and sales activities play together. Keep in mind that inbound marketing is not only on the marketing department’s table. Inbound marketing is a lifestyle change, and it requires continuous work that will change the entire organization’s way of thinking. It is therefore essential that you are well dressed for the task. HubSpot has a comprehensive education program, which is offered to partners and subscribers, but some of the material is available and free for all. At HubSpot Academy you can find blog posts, learning resources and video material that suit you well to work with inbound marketing. The training program also includes a number of certifications, so you can test yourself and your team and get an overview of the skills your team members have acquired. If you go and consider starting inbound marketing, HubSpot Academy is a great place to start. Inbound marketing is still a new discipline for many, and employees with good skills with inbound marketing are not easily found. It’s rare that a company can find all the skills needed in house so it’s likely that you will find an agency that can cover some of the areas of competence. Below you will get an overview of the skills you need to cross when you are going to work with inbound marketing. You will need people with strong hands-on skills in copy writing to provide the material that will drive your “inbound machine”. In addition, you will need some people who have the technical and creative skills in web development and design. You will also need a marketing project manager with a good understanding of inbound marketing as well as sellers with a good understanding of inbound sales. In order to operate inbound marketing, your marketing team must also have analytical competencies in market research as well as understanding qualitative and quantitative data. Since inbound marketing is highly data driven, it is an absolute must that the people in your team are able to analyse the data that comes into the system. In order to make surveys in your target group, it is also important that you associate with someone who can prepare good interview design and have a general understanding of which pitfalls there are in qualitative studies. This knowledge should enable them to translate this into the preparation of your personas and other target audience surveys. It is also a great advantage if someone in your team has technical insight and understanding. If you use HubSpot, the interface is not technically difficult to use, but marketing automation is based on technical logic that is easier to learn if you have the foundation in place. Last but not least, your team must keep an eye on what your competitors are doing and what strategies can be found. They also need to know the latest digital trends and be up to date on what is happening in SEO, social media and design and functionality in the digital landscape. Because inbound marketing acts as the sales department’s right hand, your salespeople must also meet some competence requirements. They must be demand-sensitive, diagnostic and analytical in their approach to sales, and then they must know a lot about what they sell. They should also be consultants and experts that can teach then just to be the ‘classic sellers’. Execution in inbound marketing is not a matter of producing any content and then expecting it to run just like that. Especially not if inbound is new to you. There will always be something that can be improved. You will continuously need to compile new content, and the old will become outdated over time and will need to be updated. Inbound marketing is a circular process in which you execute, analyse performance, adjust to your results and re-execute. It is always your data, observations and analyses that will outline the direction of the next step. A golden rule also states that the more content you have, the more likely you are to capture someone’s interest. Would you say that you just have to ‘shoot your message with shotgun’? No, definitely not. But you must try and keep an eye on how your content works. If you’re on the go, you can ask your consultants, salespeople and customer service staff what questions they are most often asked. Then you have a good foundation to get some topics that your personas are interested in. You can also look into your data and make more content related to topics that are already popular. You may also have other types of content that can be recycled. Imagine that the sales department has some slides that get a good response. Well why not reuse the material and rewrite it into an e-book or a series of blog posts? Maybe you could make it into a video or a webinar. The possibilities are many. Also, remember to put the best and most popular parts of your content behind a download form so your visitors can convert on it. We call it gated content, premium content or content offers. For example, it may be e-books, landing pages with a quiz or a series of videos. Common to this type of content is that it must correspond to the value the users feel they “pay with”. If you ask someone to fill out a form, make sure that they are experiencing a value of the content accordingly since they have provided you with their personal information for it. Once you’ve made your content, you need to set up workflows in your marketing automation system. First and foremost, make sure that those who fill in your form are sent directly to a landing page. You also need to set the system to send an email to them with the content they have requested so you’re sure they’ll receive it and can easily find it again. Before you can set up your workflow, you must create a landing page for your form, a thank you page that your lead must land on when they have completed your form and a thank you email that they will receive with the content. Next, you’ll need to set up a lead nurturing workflow so that those who have converted on a piece of premium content, regularly get related content sent by email so you can help them further in their purchase journey. Here you must have a clear plan of the order in which the given content is to be sent, and you should set up what should happen if they have already downloaded a piece of content and how to control that a lead does not end up in several lead nurturing workflows at the same time. Now you must execute your promotion strategy. Make adverts and campaigns, optimize your content for search engines, share it in social media groups, get your employees to share it, send a QR code with a pigeon – there are virtually no limits, but be sure to make sure that the world knows that you have made the content. Follow the strategy that you have done before and stick to it. And make sure that your efforts are made. The actual production of content is only a small part of your overall work with the content. You need more time to promote the content than you need to produce it. Once you get started with inbound marketing, you will begin to see how your leads act on your website. Your salespeople may have found that leads who viewed certain pages on your website are more likely to become customers. Now it may be a good idea to set up lead scoring. With lead scoring, you can give your leads points for a particular behaviour. Lead scoring is used as an indicator of which leads are the warmest and best match for your business. You may want to give them a high number of points to see your price page or to download your price calculator. Similarly, you may want to deduct if they have not opened your emails over a given period or because it’s been a long time since they’ve visited your site lately. You can also assign your leads a high score that match your ideal customer profile, or you can deduct them points to be a bad match. Once you’ve been in inbound marketing for a while, you can also start targeting your communication even sharper. It may be that leads that are a long way in the purchase journey should see a different version of specific pages on your site than new visitors. You can also create smart CTAs, so call-to-actions differ depending on who sees it. It may be that you have two versions of an e-book with the same theme, but which are varieties, so they focus on two different personas. If you make smart CTAs, you can personalize them so that they will be presented with the most appropriate version. Depending on your marketing automation system, you will be able to customise your content according to many different factors such as time of day, location, media type, past interaction, and more. In other words, you can put your content into a larger context. Thus the name of the discipline – Contextual Marketing. It has been mentioned several times before, but it is so essential that we might as well carve it all out in stone: Inbound marketing has the advantage of storing huge amounts of data that make your marketing activities incredibly transparent. You should do yourself the service of analysing your data and adjusting your activities according to what your data tells you. As people, we tend to think a lot about what is a good piece of content and how to do things best. But when you have data available, you should base your opinions on what you can see in your data. You do not represent your own audience after all, and it’s your target audience that you’re communicating with. When you prepared to get started with inbound marketing, you made an SLA. At least we said that you should, and one thing you also need is to adjust it. You need to hold repeated meetings – for example, every quarter, where sales and marketing get together and discuss if, and where there is a need to adjust your SLA. Why should you invest in inbound marketing? Inbound marketing is the solution to how you can adapt your business to today’s customers and their buying patterns. Make sure your customers find your website and help them through the buying process by transforming your website from a business card into a lead generation machine. As soon as you share valuable information in your field, it is you who appears as the expert. Does this sound interesting? Contact us for a free and no obligation advice session here.